Where did the idea for 10 Things To Do Before You Leave School come from? I’m fascinated by lists. We all make them – from shopping lists and mundane daily to-do lists to more ambitious ones to do with hopes and aspirations. One of the Lists people like to make is ‘The Bucket List’, a list of things you want to do before you die. There are many novels (and a film) about this very idea, but I wanted to write a different kind of ‘bucket list’ novel – one in which a girl at school finds a bucket list written for her by a parent who is no longer around. When I started to write it I realised that one of the problems with a ‘bucket list’ is that it covers a whole life. So I asked myself what would happen if the list covered a shorter period of time? What would happen if it became a ‘school bucket list’? This would give me the chance to focus on a significant time in everyone’s life – their last year at school. That’s when the novel started to take shape. The List was the starting point but it soon became about much more than that – grief, mental health, and leaving school. Why have you chosen to write about mental health? When I started teaching no-one spoke about teenagers’ mental health, and even when it came to adults there was a reluctance to talk about it directly. By the time I left teaching the issue had become high-profile both in schools and in the media. Now everyone seems to be talking about it, but that doesn’t mean they’re always talking about it in the right way. As Head of Sixth Form and as a parent I witnessed the pressures that students nowadays are under – the need to succeed, the need to be happy, and the need to have the ‘perfect’ life that social media misleadingly leads us to believe is possible. It doesn’t take much to tip someone over the edge. In Ruby’s case it’s the death of her father, but it can be anything and it doesn’t always have to be that dramatic. I wanted to show that “it’s OK not to be OK” and that even in the middle of grief and pain, it’s possible to find light moments. I wanted to give a sense of laughter through the tears. And of hope. What other issues does 10 Things To Do Before You Leave School explore? Excessive mobile phone use, the decline of the handwritten letter, writing personal statements, and ‘Muck-Up Day’, that riotous last day of lessons. What 10 thing s did you want to do before you left school? Getting through was probably top of the list and not far behind would be the familiar aim of doing well in your exams. There were other things on it that perhaps best remain a secret. The thing about lists is that you have several versions and there will definitely be one that you choose to keep to yourself. Another thing about this list is that the items others might want to put on it for you might be very different from your own. 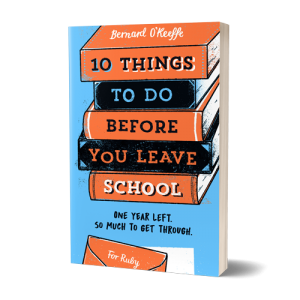 10 Things To Do Before You Leave School shows that what your parents want for you is not necessarily what you want for yourself. 10 Things…. is a Young Adult novel. How useful do you find the term? I’m not sure how useful the term Young Adult is, mainly because I’m not sure what the criteria are. Does it mean that the central character is an adolescent/ Young Adult, or that the situation is one that Young Adults can relate to or are familiar with? Does it mean that the language and the way the novel is written is in some way ‘watered down’ or not quite challenging enough to be ‘fully’ adult? I don’t think so – I certainly didn’t write 10 Things… in anything other than an ‘adult’ way. Many of the greatest novels feature adolescent characters but are not specifically written for that readership – Oliver Twist, Great Expectations, Lord of the Flies, The Catcher in the Rye, The Adventures of Huckleberry Finn. And all of these deal with themes which are frequently explored in YA fiction – coming of age, identity, family, friendship. Maybe we are all ‘young adult’ at heart? We’ve certainly all been to school, so maybe any novel set in a school, written from the perspective of a pupil (like 10 Things) is, by definition, a Young Adult novel. The fact is there is huge crossover appeal. Research shows that as many as 70% of YA readers are adults. You taught English for many years. How has that helped you as a writer? Teaching English both helped and hindered. When you’re teaching great books (Great Expectations and The Great Gatsby are aptly named) you look at your own attempts in that context and that can be intimidating. And when you’re always analysing and taking things apart for examination purposes it can dry up your creative juices. But daily contact with young people made me aware of the pressures they face. And I spent many years as Head of Sixth Form, so I saw several generations of students through their last year at school.